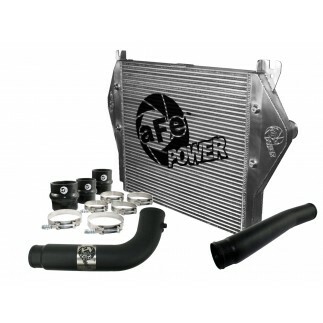 aFe Power's new deep transmission pan brings performance engineering to the protection of your truck's transmission. This transmission pan has a 2 to 3 quart additional capacity over the stock pan. A magnetic drain plug and a n additional 1/8" NPT port for your temperature sensor are also included. Built-in internal and external fins transfer heat from the fluid to the outside air for maximum cooling. This transmission pan is constructed out of durable die-cast A380 aluminum with reinforced ribs and a wrinkle black powder-coated finish with machined fins for maximum strength and styling. This cover fits the 68RFE transmission and is supplied with silicone for a leak-free seal. No modification to the dipstick is needed. Notice: the internal spin on filter and flat pick-up filter screen is not included. These are dealer items.